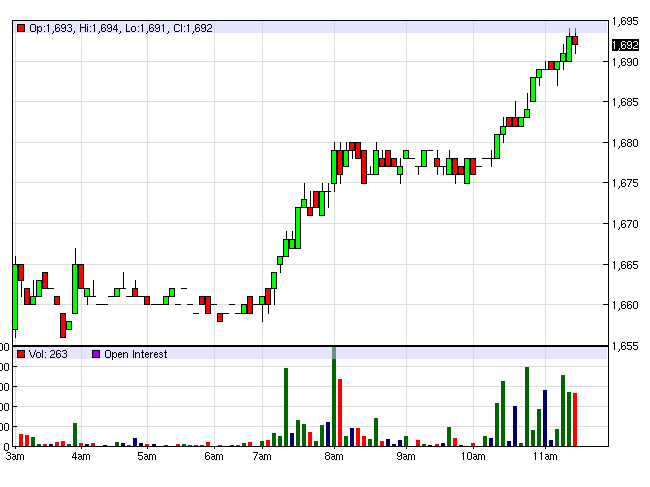 On the ICE Futures Europe floor, Robusta prices continued upward momentum. September futures for immediate delivery rose 32 US dollars, equivalent to 1.89%, up to $ 1,693 / ton, delivery period in November increased by 30 dollars, or up 1.75%, to $ 1,711 / ton and period April delivery rose 31 1/2016 term dollars, or 1.8%, to $ 1,727 / ton, the increase was significant. Fluctuation range is quite wide. Trading volume on average. Similarly, on the floor ICE Futures US, arabica coffee prices also continued to rise. September futures for immediate delivery rose 5.7 cents, or about 4.46% to 133.5 cents / lb, delivered December period also increased by 5.7 cents, an increase of 4.36%, up 136 , 55 cents / lb and futures for April delivery added 5.65 cents 3/2016, which rose 4.21% to 139.9 cents / lb, the very strong growth. Very high trading volume on average. Although Reais strong recovery against the US dollar and the possibility the US Federal Reserve System (Fed) rate hike early increasingly apparent, but international coffee prices rebounded strongly again, before the new crop in Brazil step into late stage not to harvest high yield as speculation. After the International Coffee Organization (ICO) issued a warning inventories in the major producing countries fell significantly, due to subjective speculation has boosted sales while prices are low, there can create rapid price rise as of March last year when the main consumption market starts buying. Coffee prices become unpredictable when more and more speculation, inference subjective mixed, while the global macro economy are many negative manifestations gave investors seemed crisis direction when choose investment channels. A specialist agricultural commodity markets in Miami, Florida - USA for speculation at the moment that is like "counting chickens before they hatch" when not paying attention to the actual developments in crop-producing countries today increasingly adverse climate change, extreme weather, unusual, but for agriculture, which is the leading factor. The international trader said coffee inventories in Vietnam by approximately 30% last season in the hands of farmers and domestic traders to make very difficult given the reference market prices too low international coffee . But they are expected to be launched coffee sold massively in the second half of August, due to the financial needs eve new harvest, leaving the roaster on the main consumer markets are raising hopes Robusta coffee will buy cheap.